May has sped (or should I say coasted) by faster than a rookie at the racetrack and it officially feels like summer. 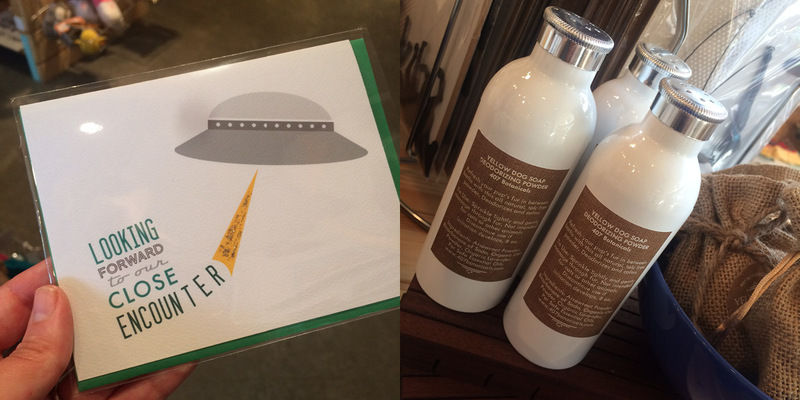 This week we’ve got new product and a little list of some summer pick-me-ups to get your season started off right. 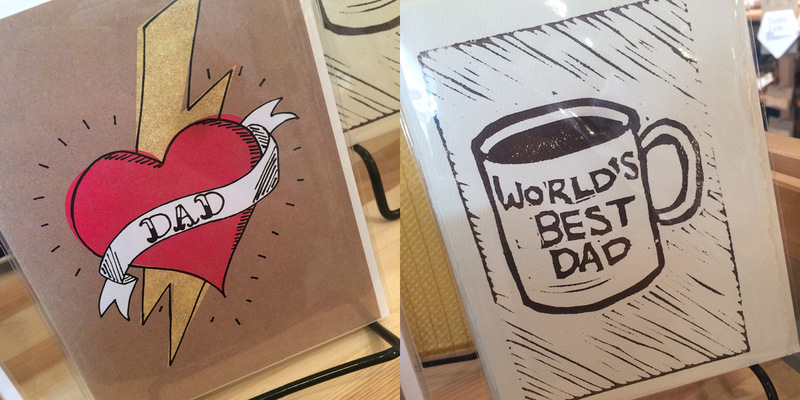 Father’s Day cards are just starting to come out of hiding, these three are from Cracked Designs, Wry Goods, and Moss Love. 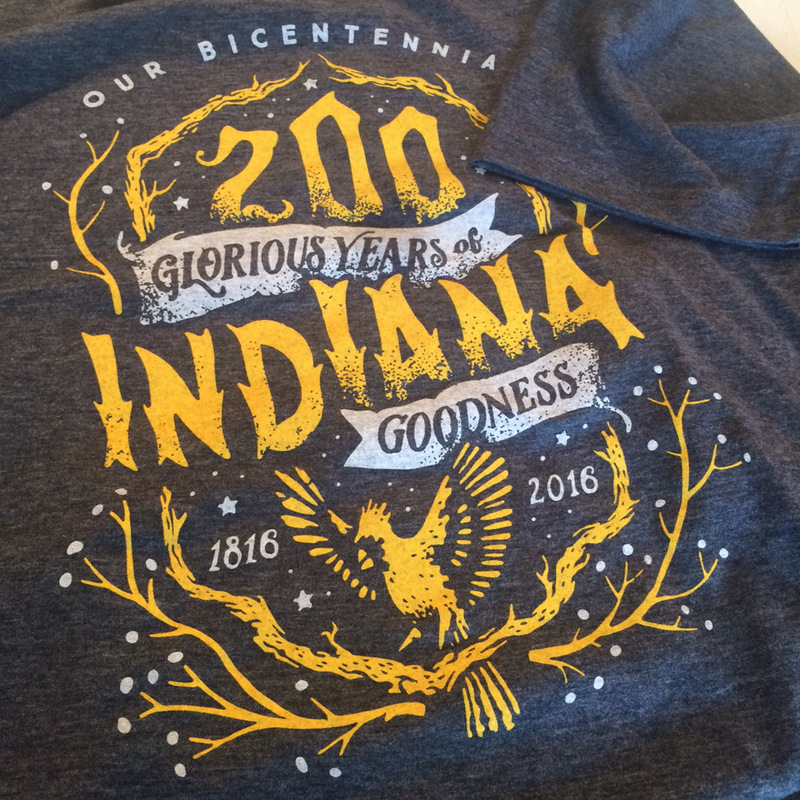 This great bicentennial design is restocked in all sizes, from Yonder Clothing. 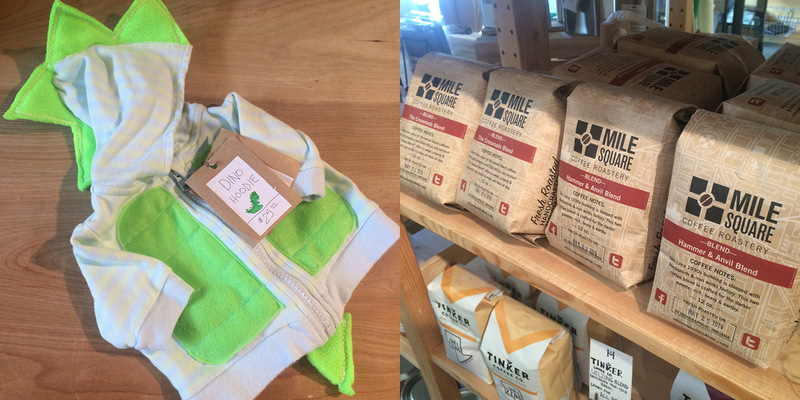 We’ve got a restock on these amazingly adorable dino hoodies repurposed by Passarelli’s Upcycled Kidswear, and Mile Square Coffee is fresh on the shelves as well. 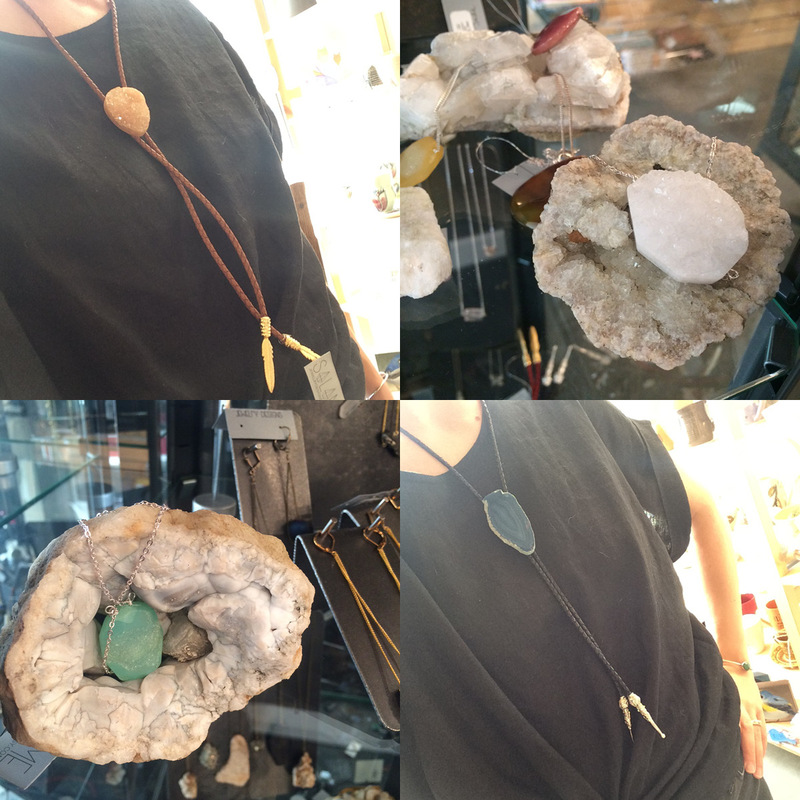 We’ve got new pendants and bolo ties direct from Salame Jewelry Designs. I was having too much fun taking selfies with these awesome bolos! They go with everything. 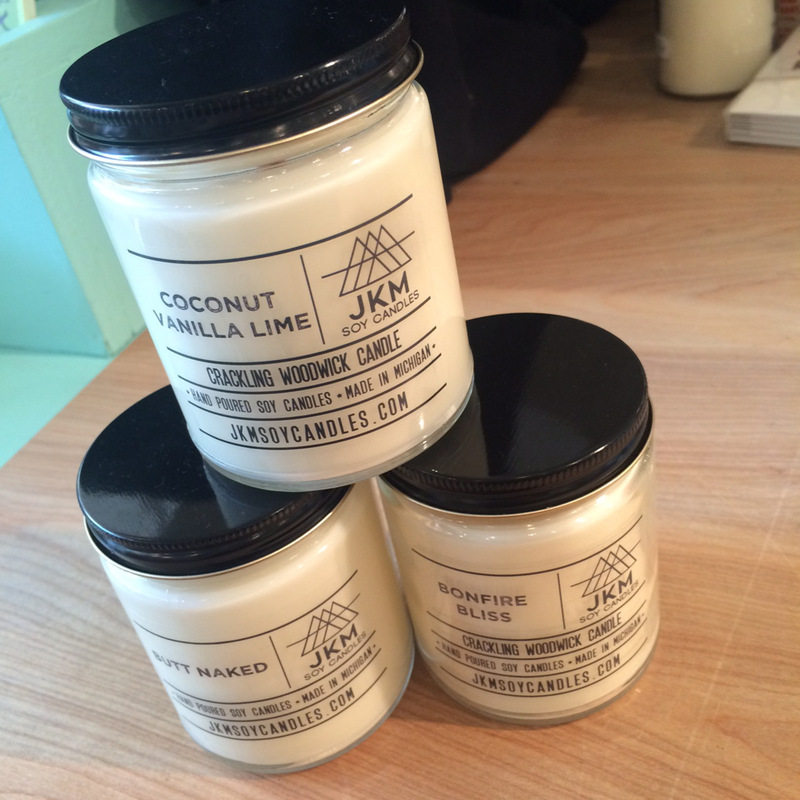 JKM sent us lots of lovely candles from their newly re-branded line. Take some time to come in and take a sniff of the huge variety of scents. 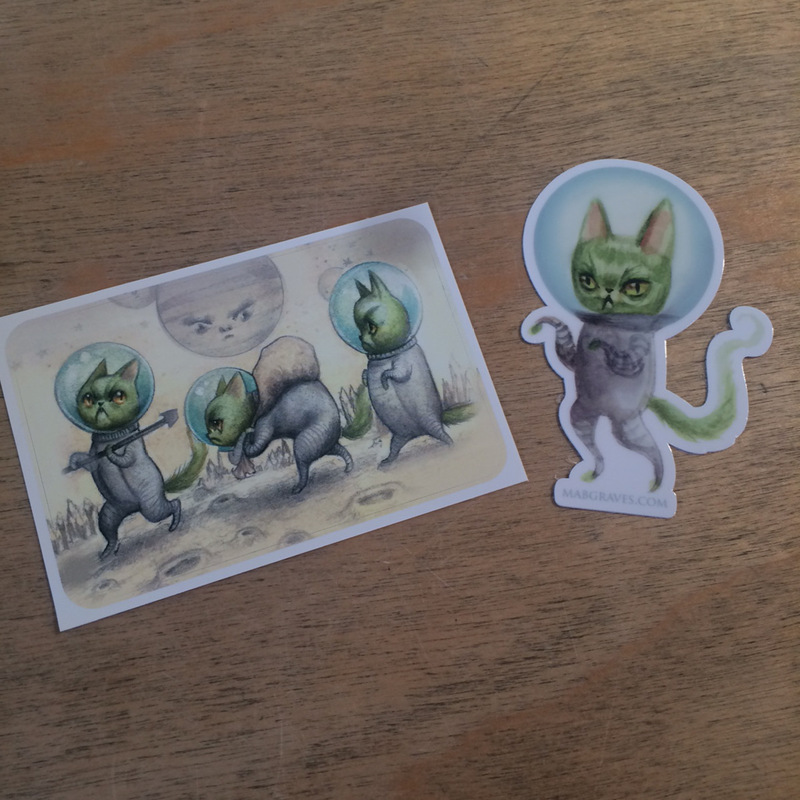 Also more beauties from Isette jewelry and robots from Vanessa Monfreda. 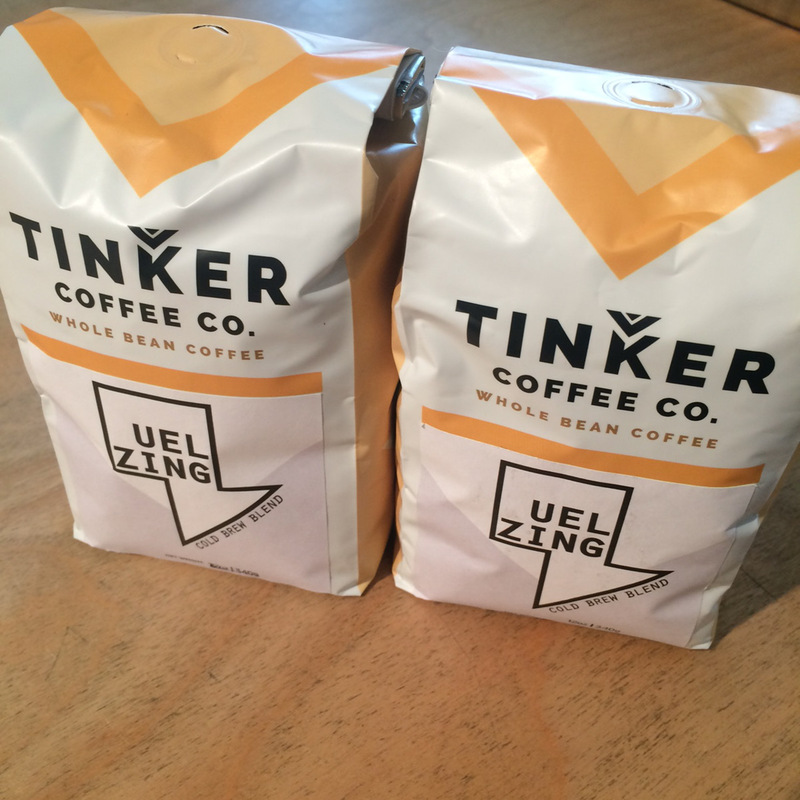 This special Cold Brew Blend is a collaboration with Bloomington’s Uel Zing and smells absolutely amazing. Lots of bath and body to keep you protected this season. 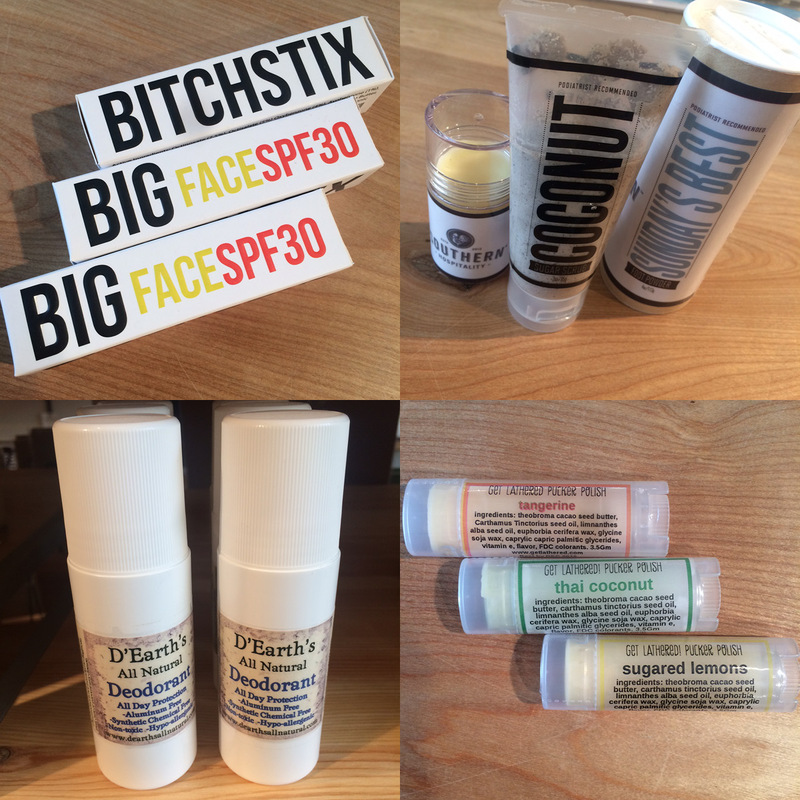 Face lotion with SPF 30 from Bitchstix, get your feet sandal ready with Southern Hospitality’s line of foot care, delicious juicy fresh scents in Get Lathered’s Pucker Polish line, and don’t forget the deodorant: D’Earth’s All Natural has you covered without any of the chemicals. 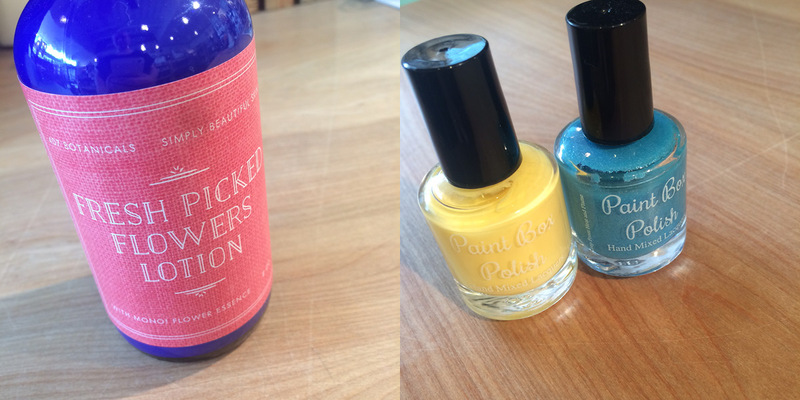 Smell nice and fresh with this lotion from 407 Botanicals, and these two Paint Box Polish colors had me feeling like a breezy day at the beach. 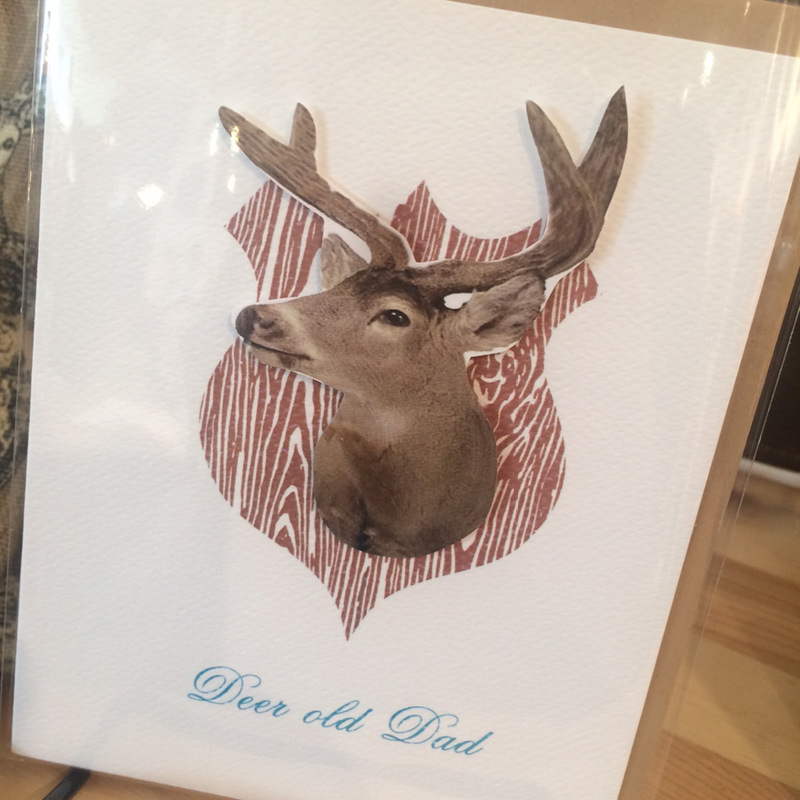 Father’s Day Pop-Up with Howl and Hide: Saturday, June 18th, 10am-4pm: Howl & Hide will be instore with tons of goodies for the man, the myth, the legend… YOUR DAD! Please join us as they will be stitching an exclusive wallet in store and will be offering 20% off all day long. Ditch the card and get your pops something that will last a lifetime! 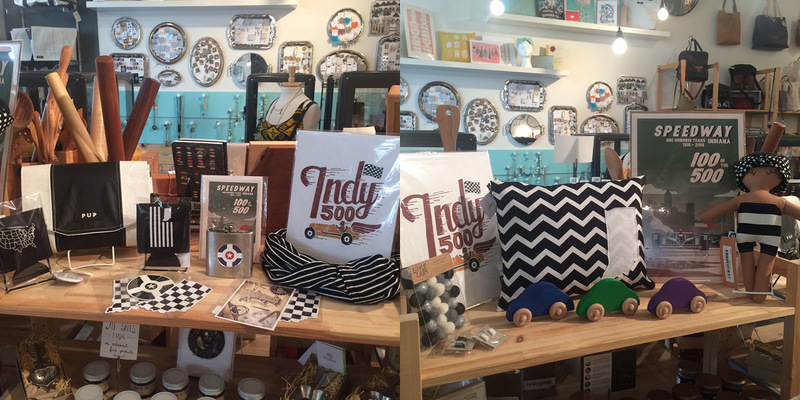 Hoosiers everywhere are dropping coins in fountains wishing for good weather this Sunday, but whether your wishes for the weekend involve carburetors or cards, we have lots of handmade options to have fun browsing. 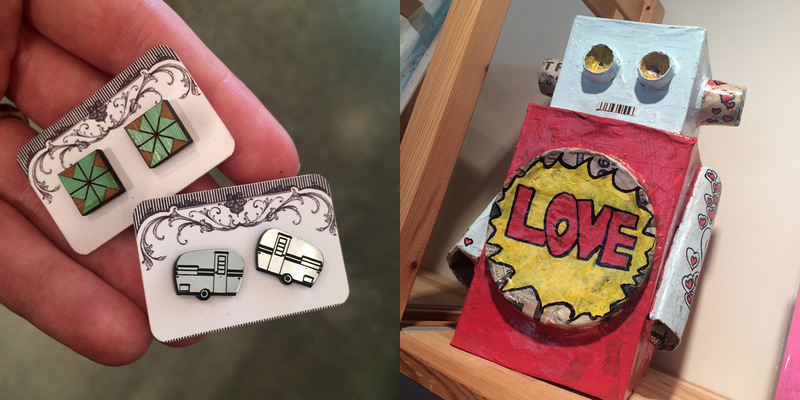 Cheer on makers locally and worldwide by shopping at Homespun! 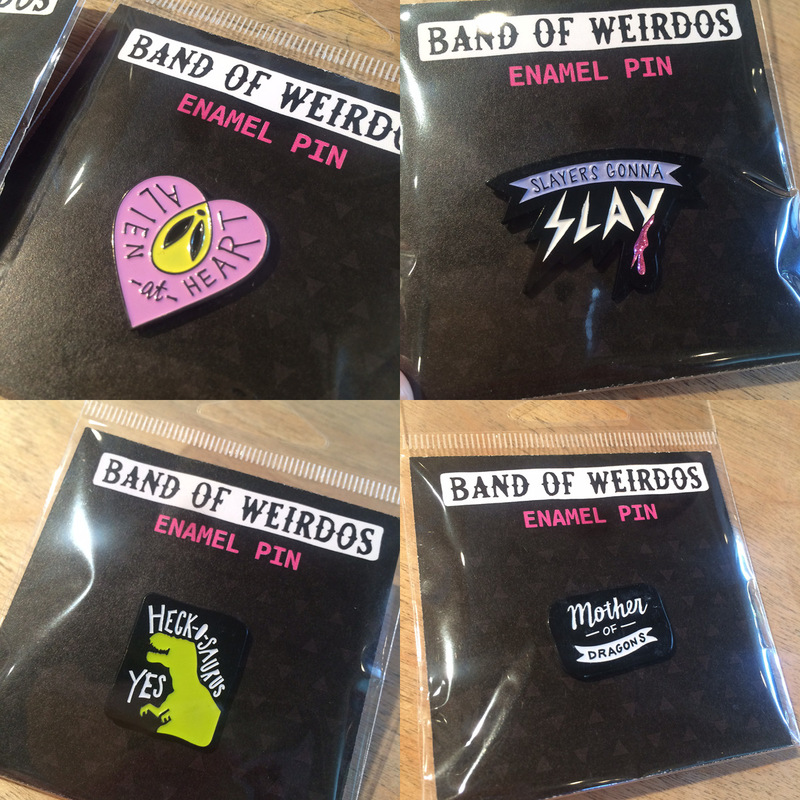 Lots of irresistible enamel pins just in from Band of Weirdos. 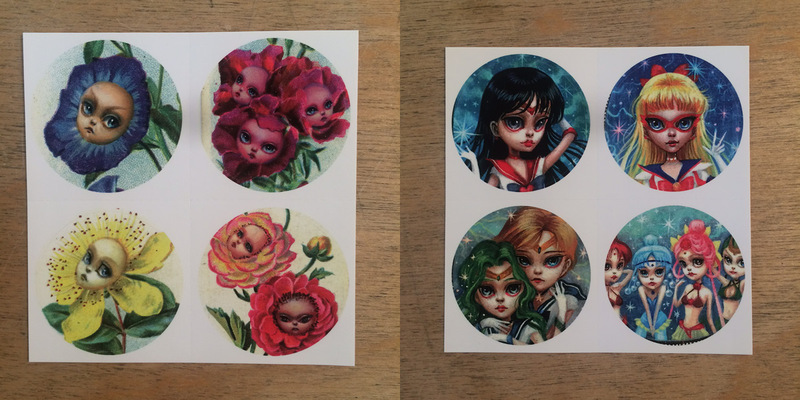 Adorable new stickers from Mab Graves. 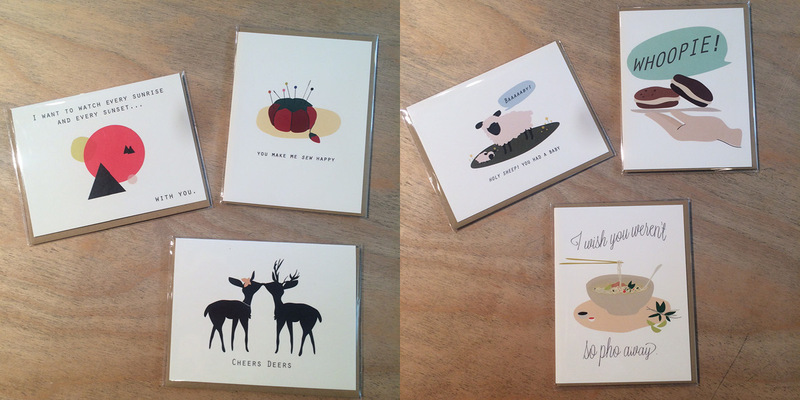 All kinds of funny with these new cards from Boxberry. Fun, striking, gorgeous, I could go on. 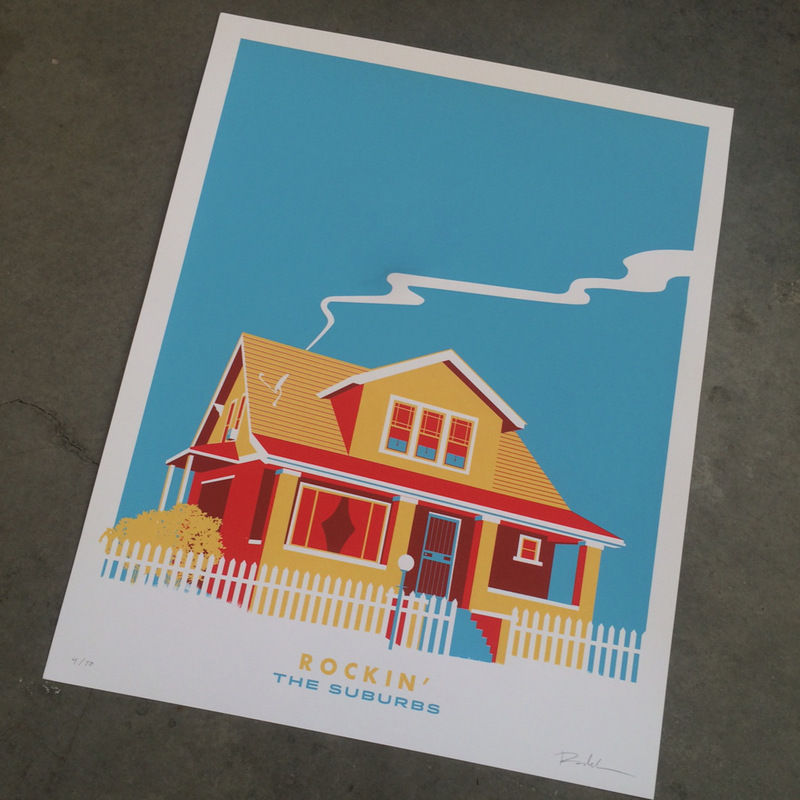 Brand new print from the fabulous Ronlewhorn. I may have accidentally drooled on this crisp new toddler shirt from Lilla Barn (dibs! 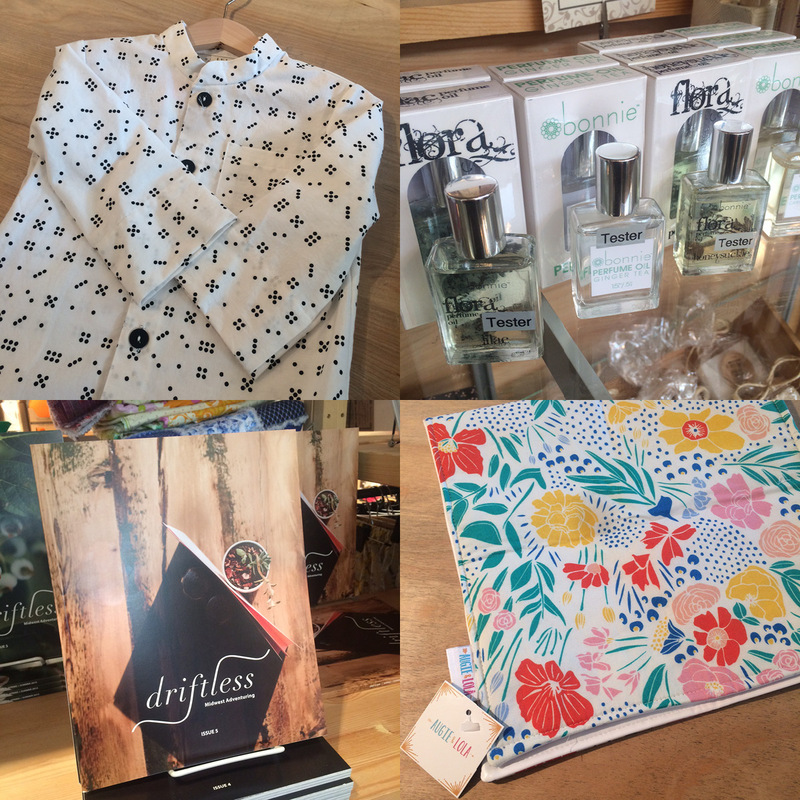 ); brand new perfume oils from Bonnie with their already famous scents; this floral fabric will cheer you up every time you wipe up, changing pad from Augie & Lola; and a brand new issue of driftless! New card from Cracked Designs and this new deodorizing powder from 407 Botanicals comes just in time for extra active dogs in the beautiful springtime weather. 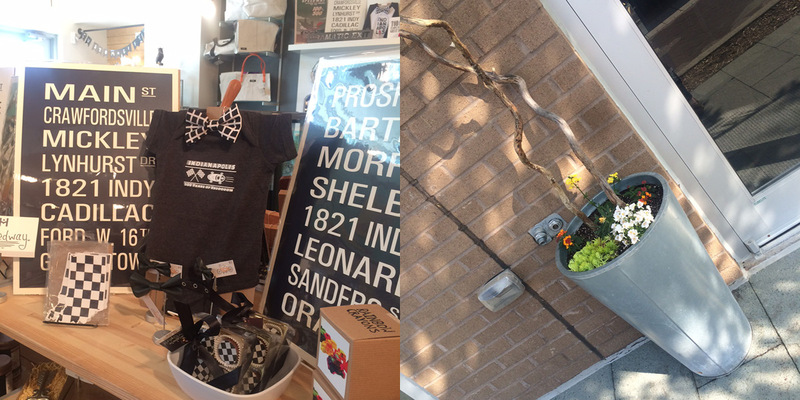 Lovely race themed display by Ian and beautiful new potted plants by Rana. I love our talented staff! Dress by Nicole’s Threads, choker combination of Dainty Daisies scarf and Hatcraft Studio flower; buffalo check scarf by Just Liv, tee by Keep Indy Indie, and leather bag by LM Products. 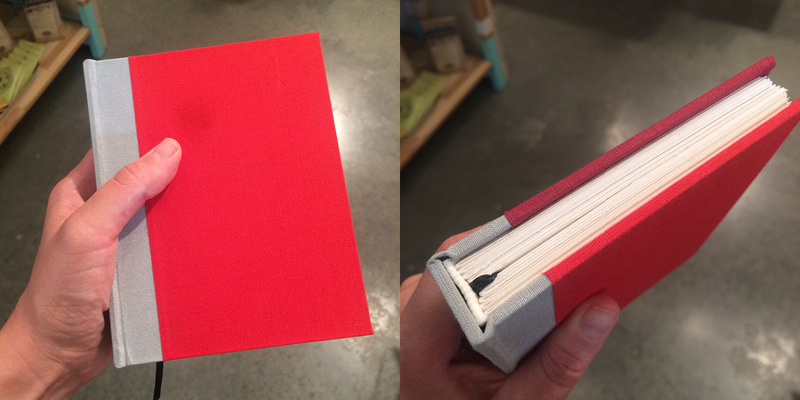 Amy loves this hardcover book by Read Write Books (that’s me!). She says she loves the “exquisite craftsmanship, I feel like I’m holding a friend! Such a beautiful selection of materials!” Did I mention I love our staff? Thanks Amy! 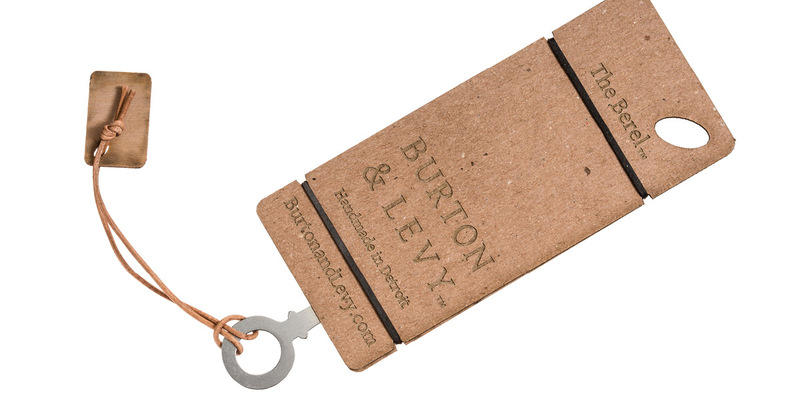 Burton & Levy is a line of beautifully crafted combs hand made in Detroit, MI by Jason Burton. My favorite thing about Burton & Levy is represented in this quote from their website, “the Doyle arrives lightly buffed with conservationist’s wax, which will give way with use. Your comb will develop gold and brown tones in patterns unique to you.” This is what handmade does! It takes a simple, throw away, cheaply made product and makes it meaningful again; makes it valuable, interesting, and beautiful. Who would have thought you could get excited about a comb? But trust me, these combs are something to get excited about- not to mention the exquisite packaging. I start by saying “I’m a metalsmith and a designer.” When we get around to talking about the combs I make, the surprise doesn’t come from what I make, but how I make them. “Metal? By hand? 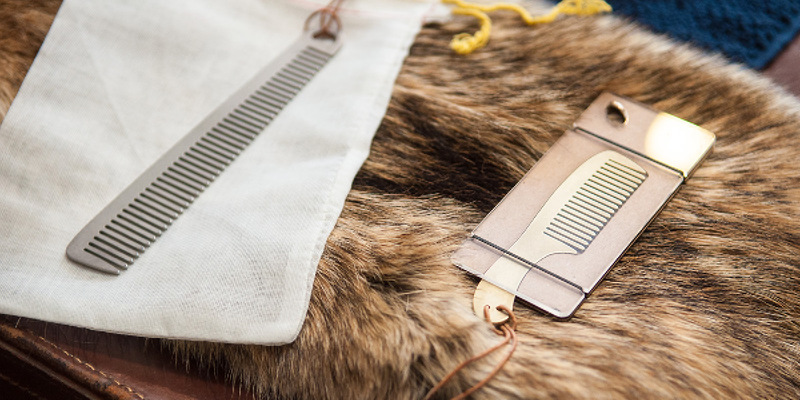 You do the packaging, too?” Most people are accustomed to thinking of a comb as a cheap, replaceable object. They’re surprised to see it rendered as something beautiful and durable, something they can cherish. I make things to satisfy my curiosity and to feel connected with the world around me. I think this is a need we all share! While I’m drawing designs, someone else is repairing a car, baking their favorite cake, or planning a garden bed – creating something. 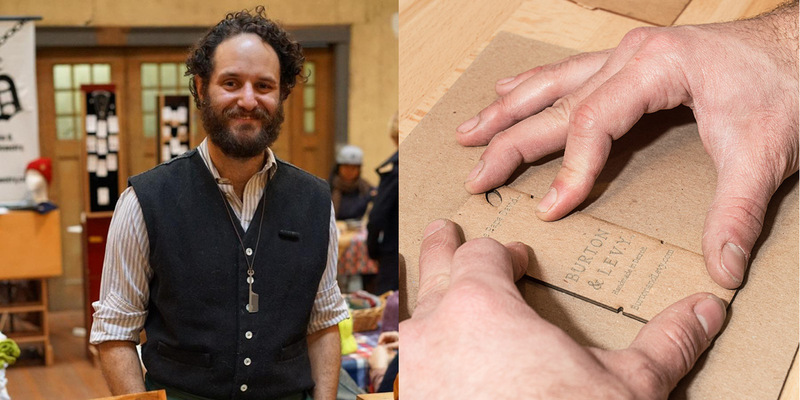 I think people see the care and passion I put in this uncomplicated thing, a beautiful beard comb, and that resonates with their own daily passions for making. That’s why I make – to share that connection. 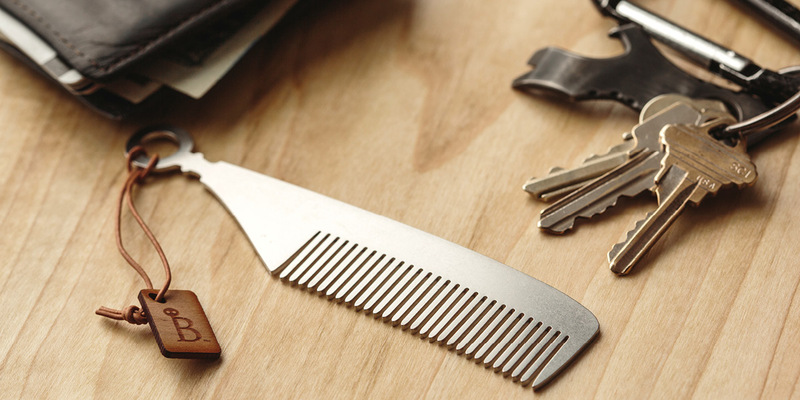 3| What makes a beard comb different from a regular comb? 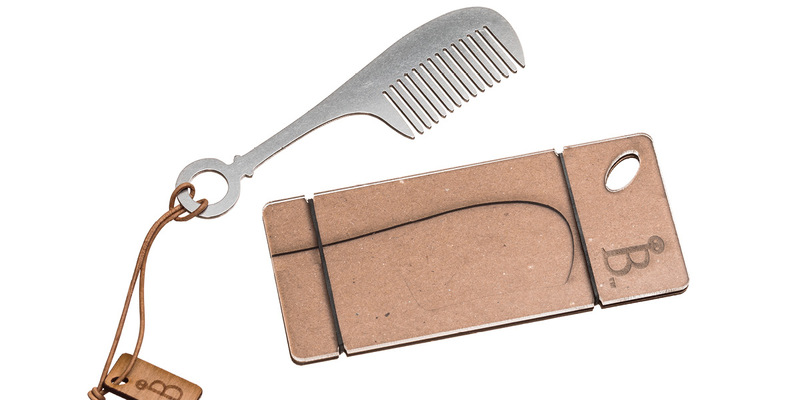 A beard comb is shorter than a standard comb, so it’s easier to move around the face than a normal hair comb (no more weird pokes in the nose or awkward motion under the chin.) The teeth are fine for neat styling all types of hair. They work great with beard balms, oils, and waxes – just clean with warm soapy water or rubbing alcohol. And Burton & Levy combs are metal so they won’t break and travel well! 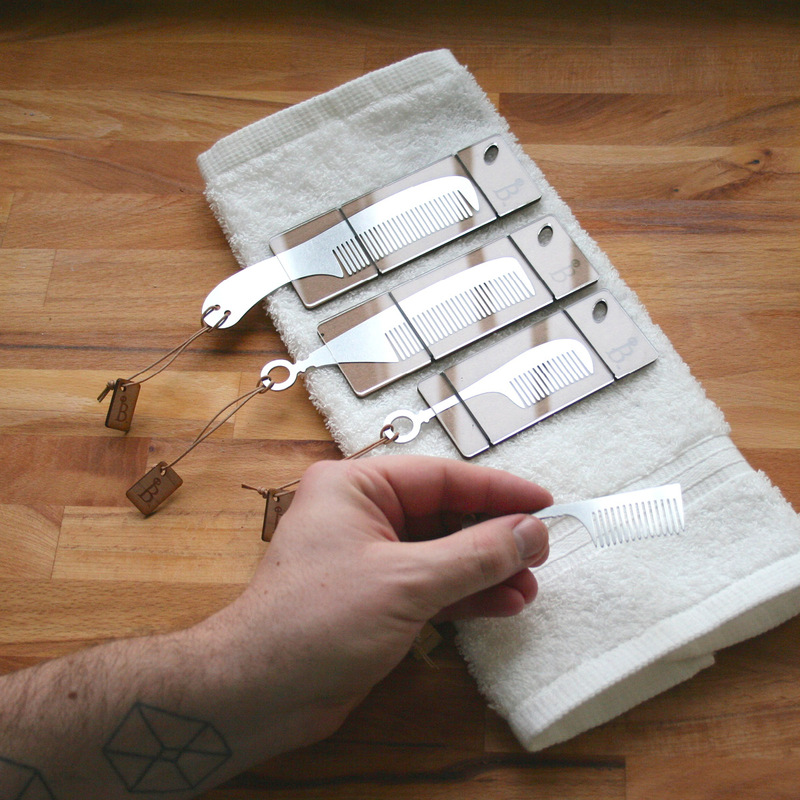 Any beardsman knows to keep a comb on hand for touchups during the day! And, by coincidence, I just published a blog about how to choose the style of comb that best suits your whiskers! It’s great when a customer loves my products, of course, but the best part of my job is building a community through my business. 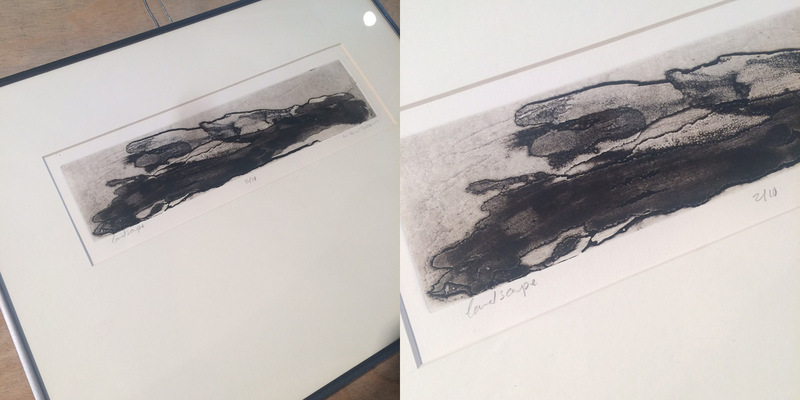 My customers feel they’ve bought a personal treasure, not just a product. 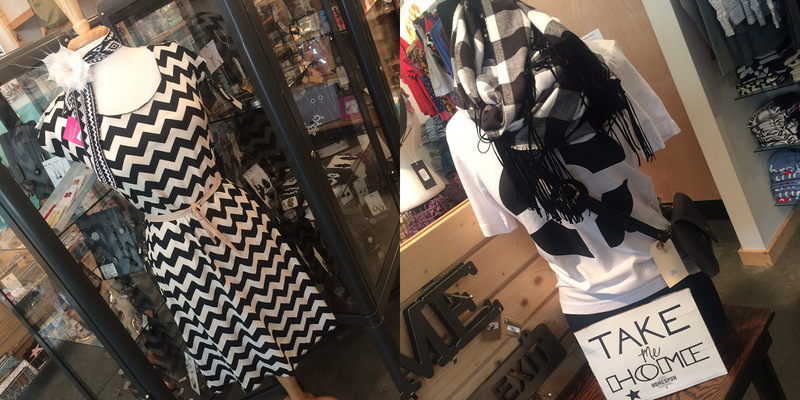 My retail clients have a sense that we’re really collaborating to help both our businesses prosper. When it comes to product partnerships, I get to work with other craft businesses, and help them reach their goals while reaching mine. This work is good work! I think “working artist” is actually a title made of two roles: artist and businessperson. I’ve been making things my whole life, so you might say the “artist” part of my life is an avocation; even if my art never left my studio, I’d still be making it. Starting a business around my art, though, came from an “aha moment”. My product debut was in 2014 at a beard and mustache competition in Portland, Oregon. The competitors – with some of the most amazing whiskers you’ve ever seen – enjoyed my unique products. They loved the unusually fine materials, and they told me it was a pleasure talking to and buying from the designer. It was a much richer experience than just grabbing a plain comb off a drug store shelf. I became hooked on recreating that experience for customer after customer, and I started my business to do just that. I keep a studio in a large, repurposed industrial complex in Detroit. 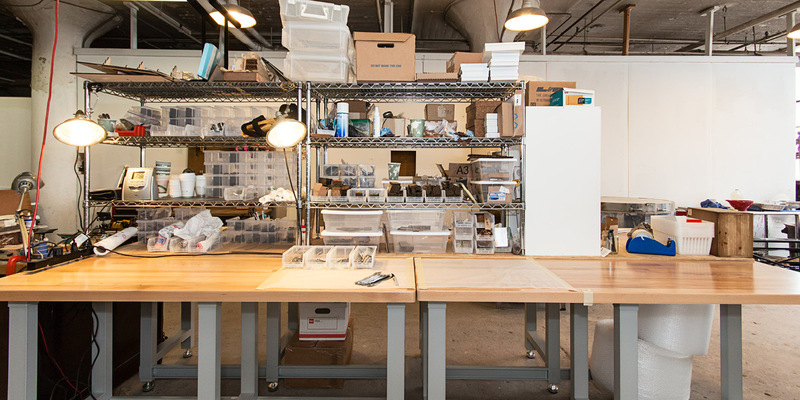 I organize my work space to accommodate a mixture of structured tasks and exploratory projects. When I start my day, I want to get momentum going, so I put on some music and handle methodical tasks like comb finishing, package construction, or packaging orders. New ideas seem to come to me faster during the afternoons, so after dropping shipments at the post office, I can dig into sketching and prototyping the new designs and product collaborations that are always simmering. 7| If you could swap lives with another artist, who would that person be? Cartoonist/writer/painter Lynda Barry… Except I don’t want to swap with her, I want to be in the same room with her! Her work is so funny and honest and familiar. I’d love to work with her or just chat and share stories. 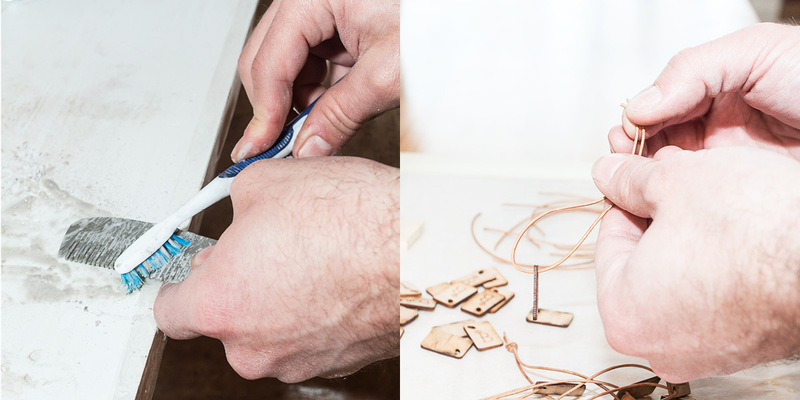 8| What makes a handmade object valuable? What really makes a handmade object valuable is how much you love having it in your life. If you buy something for the market value but feel ambivalent about the thing itself, you’re investing your money, but not yourself. 9| Using that definition, what’s the most valuable object you own? I have a wool felt hat that my mom decorated with hand stitching. She wore it every day through the Michigan winter (I’m in the process of stitching some repairs, myself!) and used to wear every day. 10| “The Doyle arrives lightly buffed with conservationist’s wax, which will give way with use. Your comb will develop gold and brown tones in patterns unique to you.” That’s cool! What an amazing heirloom this would make. I guess this isn’t a question. Comments? I really hope the man who carries a Doyle comb with him loves how unique it becomes over time. I hope he imagines passing it on to a son, a friend, someone he cares about, to take part in a tradition. I’m a big horticulture nerd – when I travel to new cities, I try to pay a visit to the local conservatory. My favorite food: blueberry pancakes. I’m just learning how to downhill ski (this is my second season) and I LOVE IT. 13| Any new comb styles or products in the works? Our (really) awesome fragrance, Odin, created in collaboration with another Detroit company, Sfumato Fragrance, is now out in retail stores and will be offered on our website soon. As for combs, I’m working on a few new styles, including combs for highly textured hair. These projects are still under wraps, but follow our blog for updates! 14| What’s the best thing about owning your own creative business? Learning how to be a good boss, and a good employer. Recognizing that we work to live, not live to work. If these handcrafted combs strike your fancy, be sure to follow Burton & Levy on instagram, Twitter or Facebook, @burtonandlevy. You can shop them here at Homespun of course, or on their website burtonandlevy.com or their Etsy shop. When race time comes around its the perfect time to pull out the cheap beer, eat all the snacks and appetizers (heavy on the cheese), and just be loud, or, ahem, “spirited.” If you want to celebrate handmade and local businesses at the same time, Homespun is your place to find unique and USA-made flair for your race day fun. 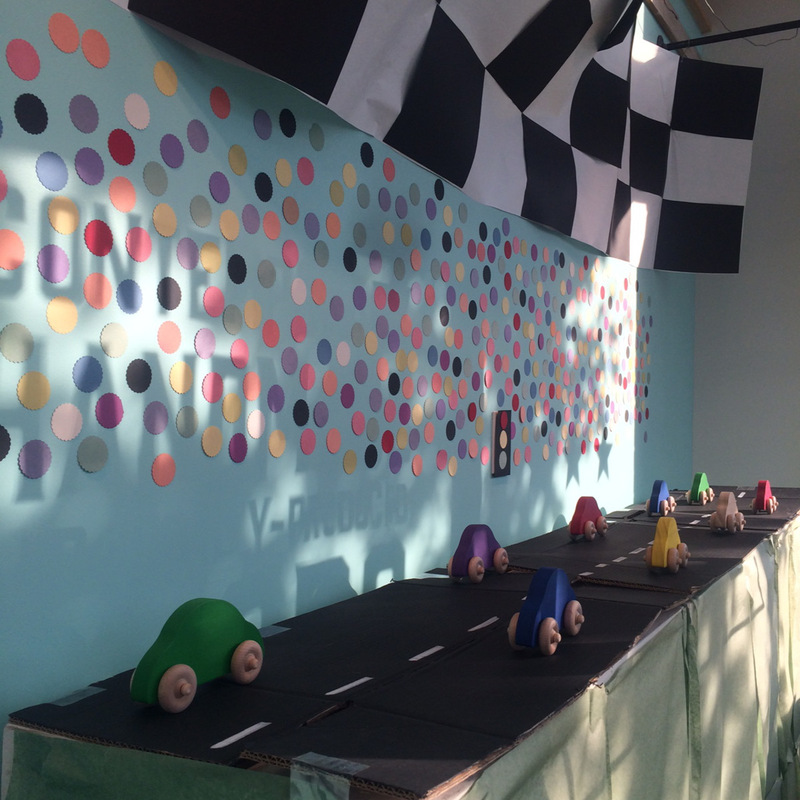 Give those tykes the need for speed early with these wooden toys from Imagination Kids Toys and Tree Hopper Toys. 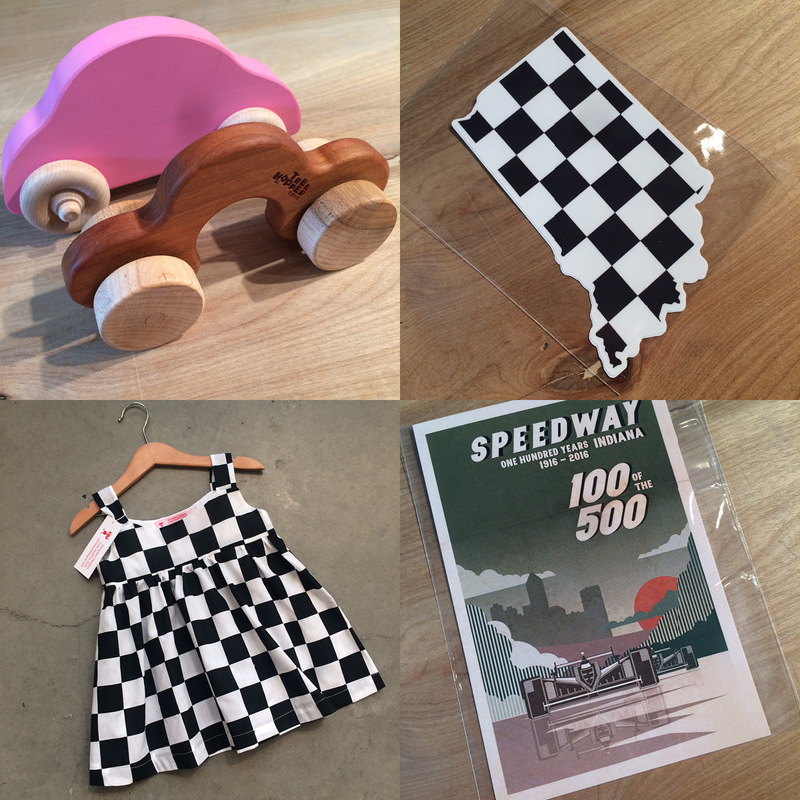 Race flag Indiana decal by Hoosier Proud, Speedway print by Indygenous, and adorable children’s dress by Donetta’s Designs. 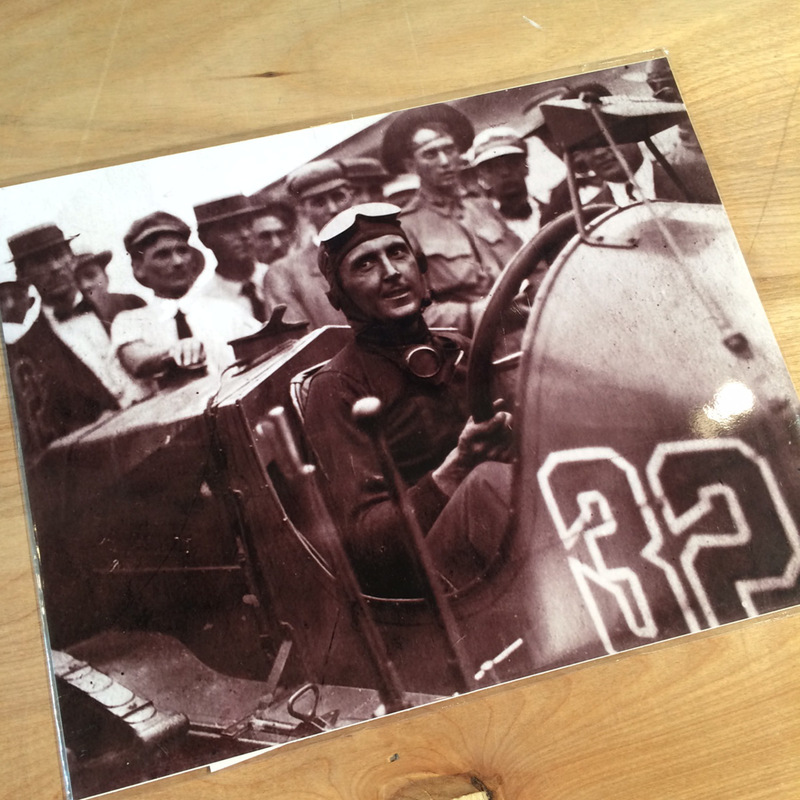 The first winner of the Indianapolis 500! I wonder what his top speed was? Beautiful photographic print by RetroIndy. 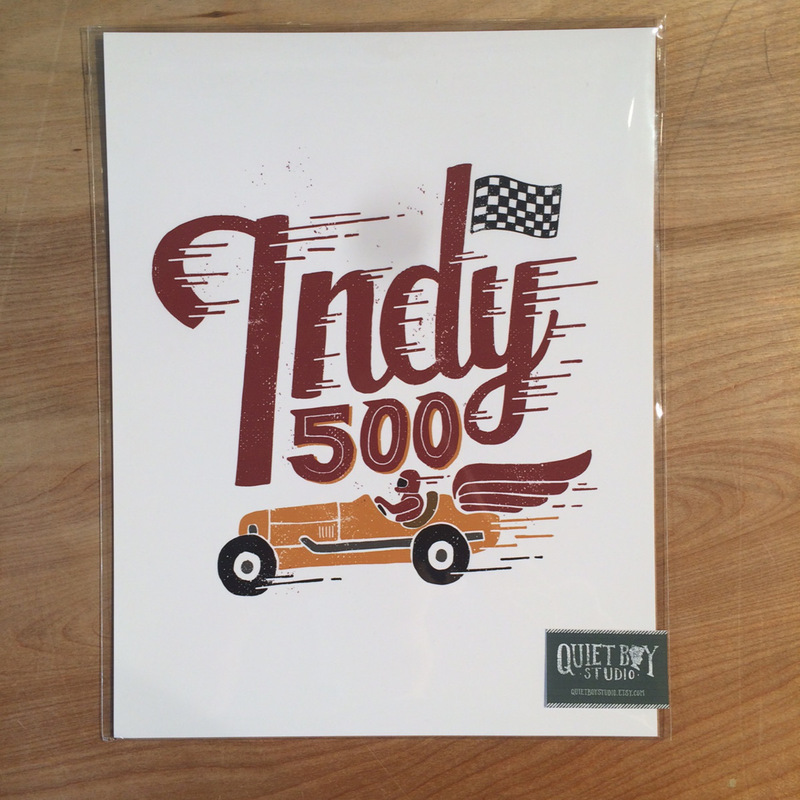 Quiet Boy Studio’s Indy 500 print is a beautiful design you can display year-round. 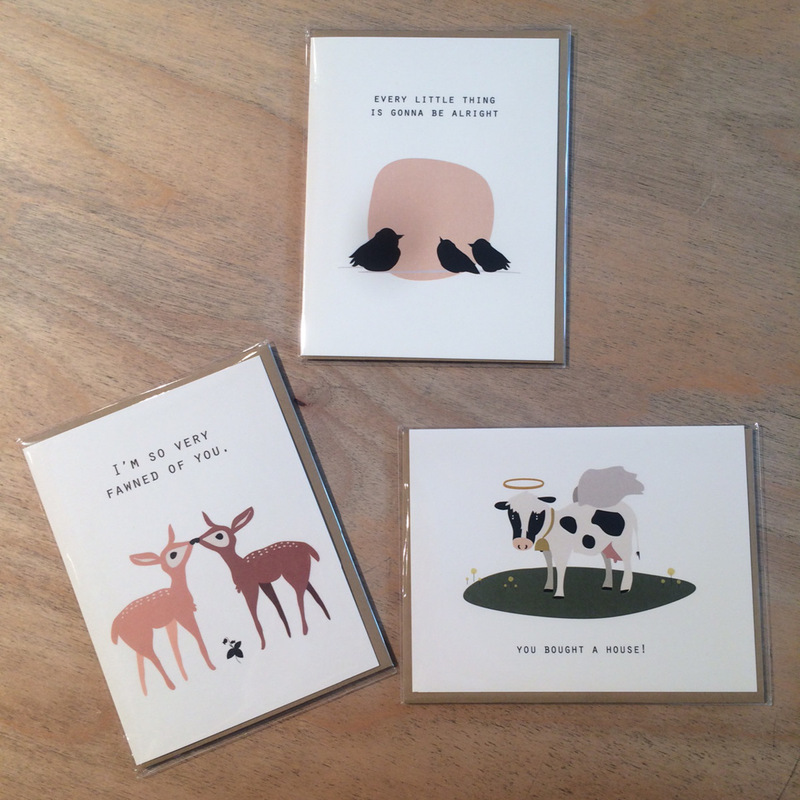 These cute designs are perfect for kids of any age, from Kitten & Acorn. Have fun out there, friends! We’re over here just trying to make it through this rainy weather, feeling like someone moved our shop to Seattle without telling us! 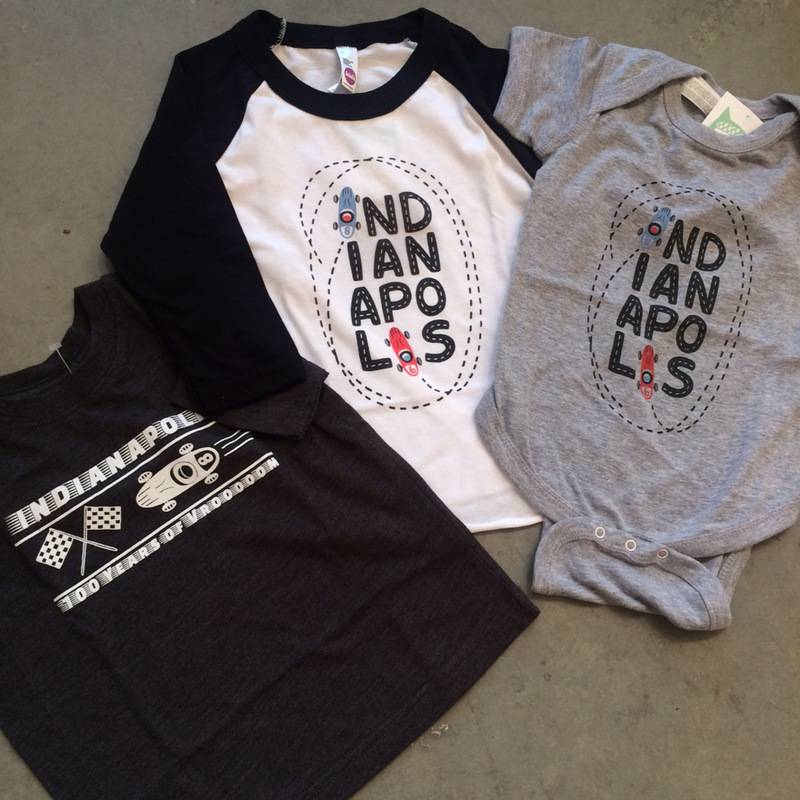 But the race flags all along Mass Ave. remind us: this is Indianapolis, racing capital of the world and we’re gearing up for race fans’ most exciting month. If you have friends or family coming to town, take a moment to visit us. 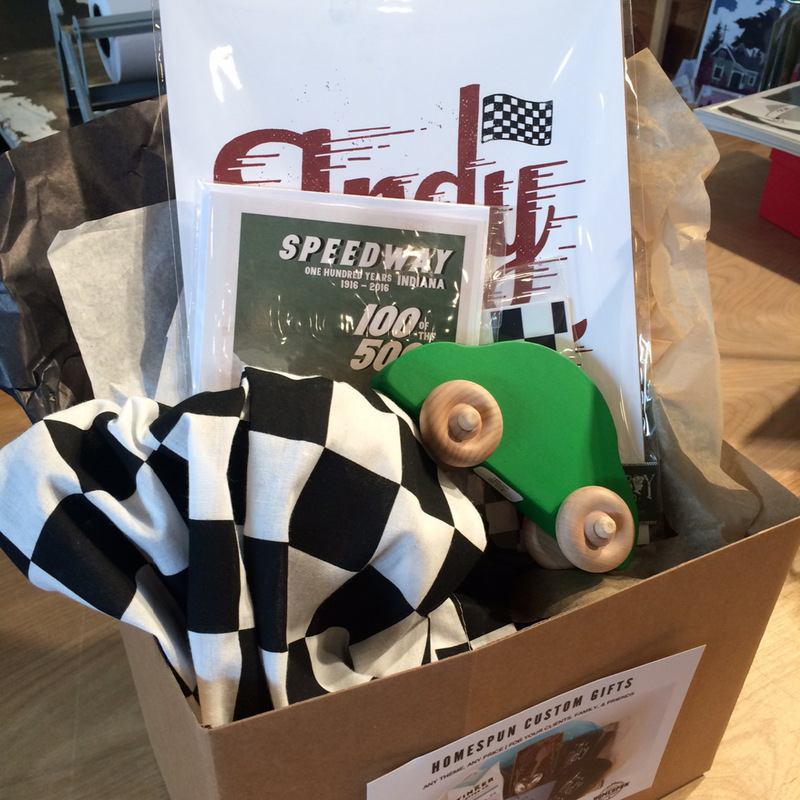 Our staff put together these cute shelf toppers to celebrate the 100th running of the Indy500. 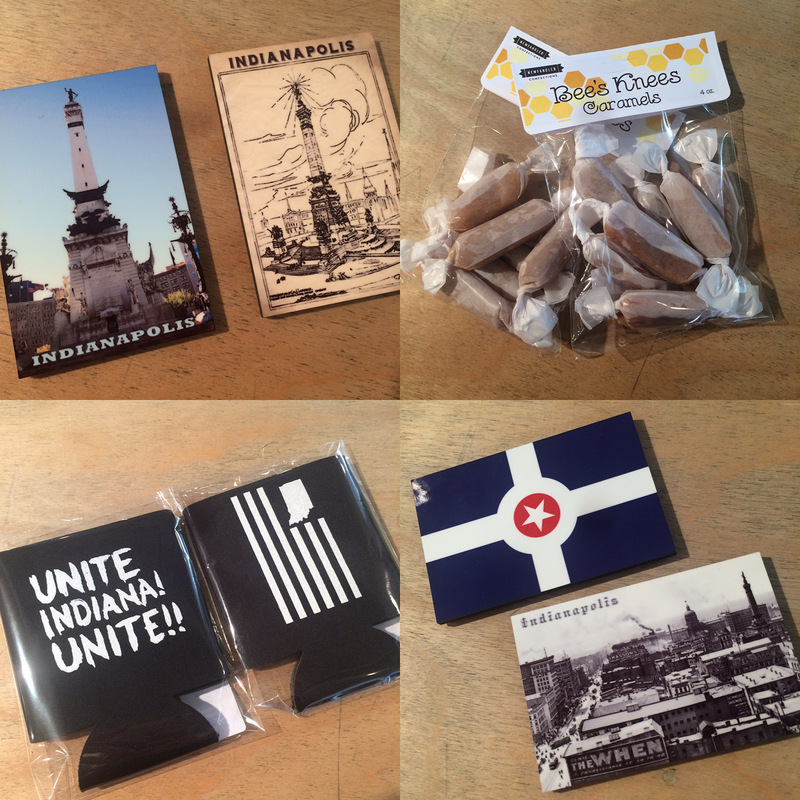 Decorative Design Works brought us four new magnets celebrating Indiana. Also, new from Newfangled Confections, makers of Frittle, these caramels are selling fast, and we’ve loving these brand new cozies from United State of Indiana. 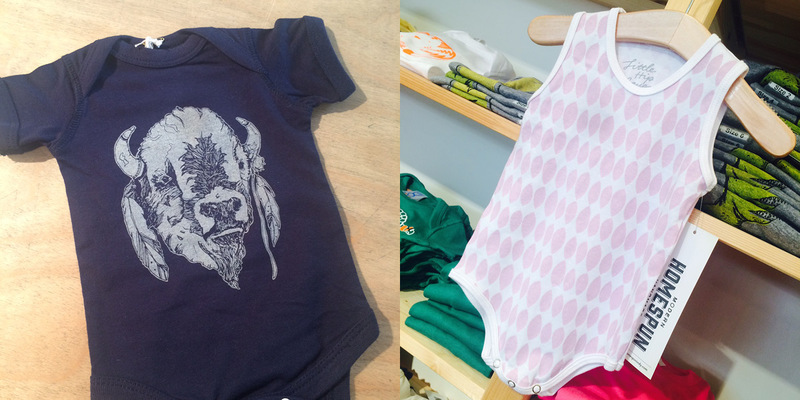 These aren’t exactly new, but how cute would your babe be in one of these buffalo onesies from Alison Rose tees? And this little tank top onesie from Little Hip Squeaks is perfect for summer. 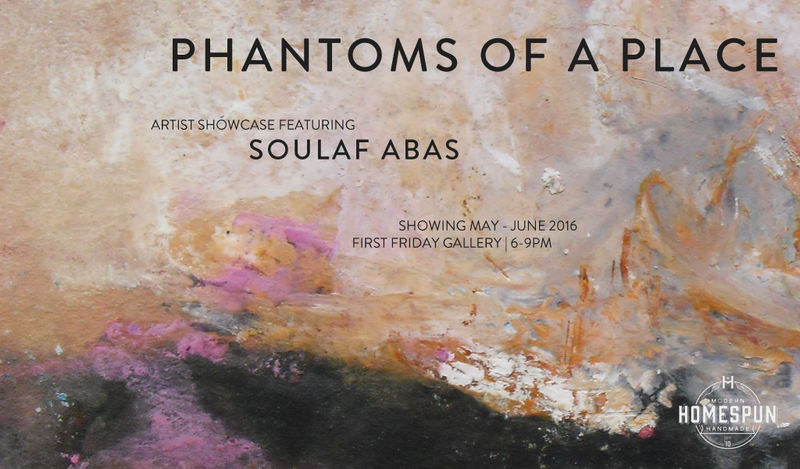 We have a brand new show up in our gallery space from Soulaf Abas. Soulaf was born and raised in Syria, where she first began studying art before completing her BFA (and later, her MFA) at Indiana State University. 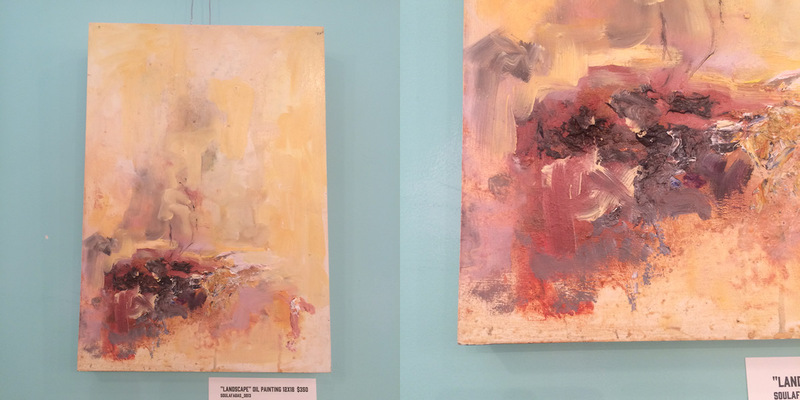 Having traveled to many countries and participated in a number of symposiums, workshops, and exhibitions overseas, she’s now a professor in her alma mater’s art department. Her work involves oil painting, printmaking, watercolor, and more. 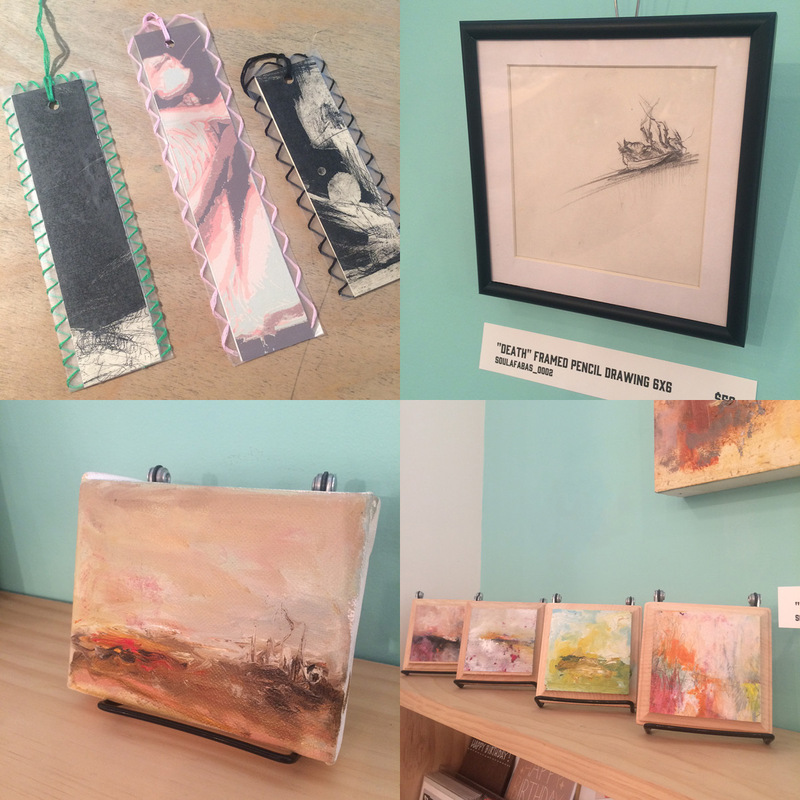 Her show includes hanging wall pieces, mini art pieces as well as extras like bookmarks and notecards; a little piece of this creative talent can be had by all! 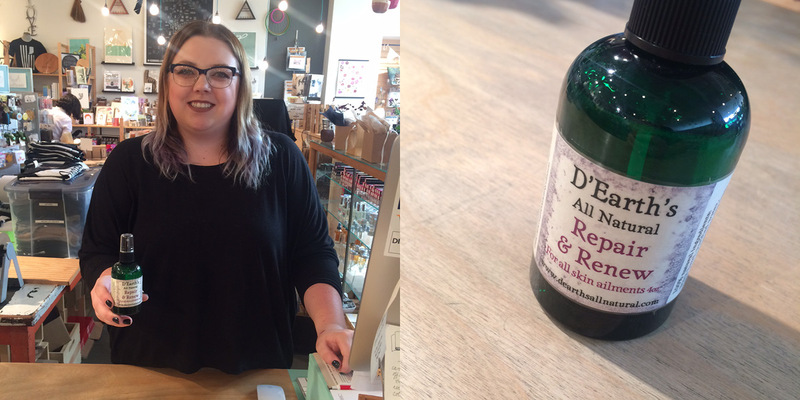 Stephanie will totally sell you on this Repair & Renew spray from D’Earth’s All Natural. First of all, she has the glowing skin to show for it. Secondly, as she’ll tell you, “having troubled skin has always been difficult and this spray is one of the few I’ve found to calm it while also smelling great!” It has a bright, citrus smell that she says wakes her and her skin up in the morning. 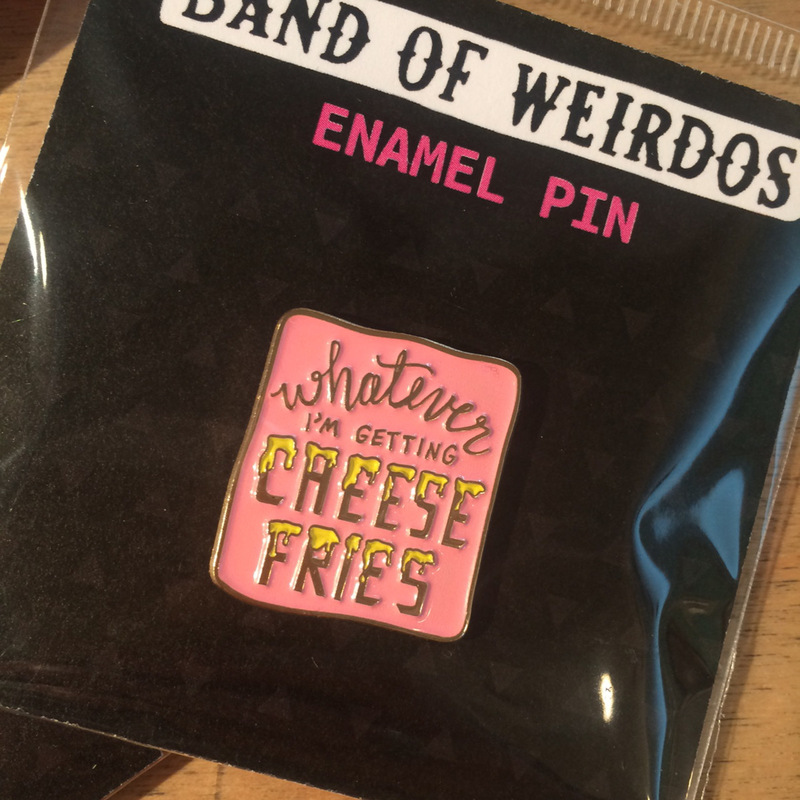 And… ahem… its $6! Thanks Stephanie!